If your 25Live customer account was created after Monday, February 01, 2016 or you have enabled the New Event Actions, see this section. Tell me more about the New Event Actions. 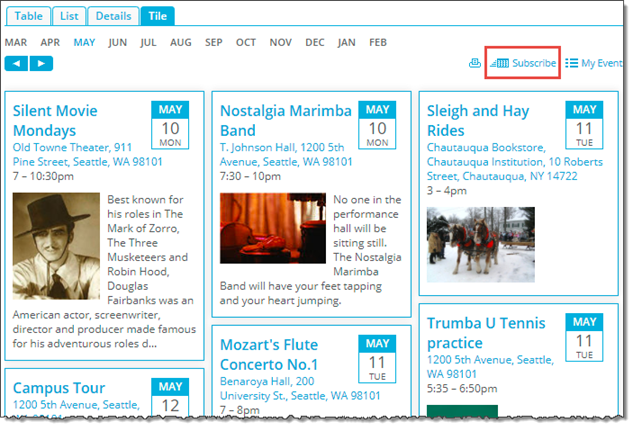 Visitors who want to stay updated about new events can subscribe to your published calendars. 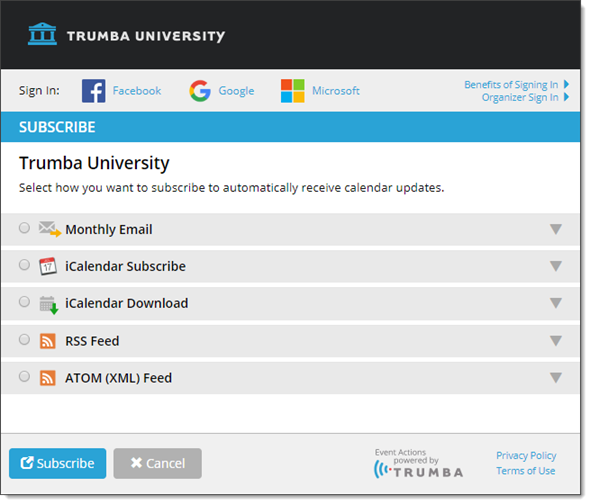 Unless the publisher with administrative privileges who set up your organization's calendars made subscriptions unavailable, visitors can subscribe by clicking a Subscribe link in the Calendar Actions panel that sits above your calendars on the right. Clicking the link opens the Subscribe page where visitors are presented with a list of subscription options and a Subscribe button. To subscribe, visitors select an option, and then click Subscribe. Each selected option is described briefly. By clicking More, visitors have access to a more detailed description as well as help about how to subscribe. Visitors who select an option see a brief description and a More link where they can get help. In the Subscribe window, visitors can select only one subscription method at a time. However, they can set up multiple subscriptions by re-opening the window for each method they want to use. If your organization supports visitor accounts, visitors can sign in before they subscribe. Those who do sign in have the option of managing their subscriptions from the My Calendars page in the Event Actions web app. Learn more. Calendar visitors see a Calendar Actions panel at the top right of your published calendars. Three of the links in the panel are subscription actions, actions visitors use to receive automatic updates when you add or change events. I don't want to support calendar subscriptions. Can I hide the links? The Help link in the upper right corner of the window provides visitors with detailed explanations of each subscription option. I'd like to read the topic that visitors see when they click Help. Do you provide an overall What can I do with this calendar Help topic that I can link to from the page where I embed my calendar? Tip Email and feed subscriptions and iCal downloads that originate from the subscribe window are never filtered. Even when visitors subscribe or download from a calendar based on a filter view or use filter and/or search spuds to create a filtered view, actions from the subscribe window always result in a non-filtered stream of events. The iCal and RSS buttons are more direct ways to access the Download iCalendar File and RSS Feed options that are also available by clicking the Subscribe link. In some cases, accessing these options by clicking the buttons has different results from accessing the options in the subscribe window. Downloaded files and subscriptions that originate in the subscribe window always include the full list of events even if visitors are looking at a filtered lists at the time they subscribe. Clicks the iCal or RSS button while viewing the full calendar, the resulting file or feed will include the full list of events. Clicks the iCal or RSS button while viewing a calendar based on a filter view, the resulting file or feed will include only the events listed in that filter view. Uses filter and/or search spuds to create a filtered view of your published calendar and then clicks the iCal and RSS button, the resulting file or feed will include only events in the filtered list. You can hide the iCal and RSS buttons by turning them off in Main calendar view Calendar Actions settings. Learn more. Click the links to familiarize yourself with each of the ways visitors can subscribe. When you publish a calendar, by default, 25Live Publisher creates a weekly digest email and allows visitors to add themselves to your distribution list. This enables you to increase your email audience when you don't know the addresses of everyone who is viewing your calendar. You can disable this option, edit your distribution list, or edit your calendar email settings at any time. I want to send email, but I don't want to allow people to add themselves to my distribution list. In the subscribe window, visitors are given two iCalendar options. They can subscribe to an iCalendar feed or download an iCalendar file. When visitors subscribe to an iCalendar feed, their browsers encounter a webcal URL. In most cases, the browser automatically hands the iCalendar feed over to a calendar program. 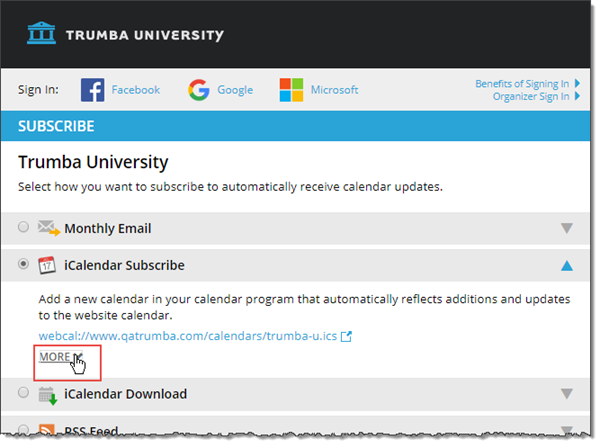 If the calendar program supports the iCalendar format, it downloads the event information into a new or existing calendar and establishes a connection with the online calendar so new events will automatically be passed on. For more details about iCalendar subscriptions with specific calendars or devices, see Subscribe to iCalendar feed. Downloading an iCalendar (.ics) file is not, technically, a subscription option. Depending upon which calendar programs and web browsers visitors use and what their browser security settings are, their calendar programs may automatically open the .ics file. Otherwise, they can save the file to their computers and import it into their calendar programs. When visitors download the file, they take a current snapshot of events starting from the current day. No connection is established with the online calendar. Events added to the online calendar after the download will not be added to the calendar on the visitors' computers. Visitors can subscribe to feeds of your events in either RSS or Atom (XML) format. Recent versions of common web browsers display feeds right in the browser. After the feed displays, visitors can decide whether or not to subscribe. What is a calendar's web name and how do I find it? RSS and Atom are types of XML code used to feed ever-changing news or other data to you. You view and subscribe to feeds from a program called an RSS or news reader or aggregator. Many readers are available free on the Web. In your reader, you can collect the feeds from the sites you're interested in, so you can keep up-to-date without having to remember where the sites are or navigate all over the Web to get the information. All 25Live Publisher published calendars include RSS and Atom feeds that anyone who views the calendar can subscribe to. Many feed readers treat the two feeds the same. However, Atom feeds use XML namespaces, which help in developing applications with web syndication feeds. For a brief overview of the differences, try the Atom Compared to RSS 2.0 section of the Atom page in the Wikipedia.